Transamerican Manufacturing Group (TMG) will be represented with a significant presence when the 54th annual Tierra Del Sol Desert Safari (TDS) kicks off this Friday. TMG brands including Poison Spyder, Smittybilt and Pro Comp will join vendors in donating multiple products to support the annual raffle held over the weekend. In addition to lending our support to the off-road community and the causes it champions, this provides our locally-based engineers the opportunity to do research and development in a real world off-road environment. Transamerican Manufacturing Group (TMG) will be represented with a significant presence when the 54th annual Tierra Del Sol Desert Safari (TDS) kicks off this Friday. The TDS Desert Safari happens March 4-6 in Thermal, California with trucks, Jeeps and 4x4s camping, running trails, raising funds for off-roading causes and awarding over $100,000 in prizes. TMG brands including Poison Spyder, Smittybilt and Pro Comp will join vendors in donating multiple products to support the annual raffle held over the weekend. Presented by the Tierra Del Sol 4 Wheel Drive Club of San Diego, this year’s event is moving the location to private land overseen by the Torres Martinez Desert Cahuilla Indian reservation. TMG will have vehicles on display including the popular race Jeep known to fans as “Crispy.” Last month, “Crispy” earned the distinction of becoming the first full-bodied Jeep JK to complete the grueling King of Hammers off-road race. 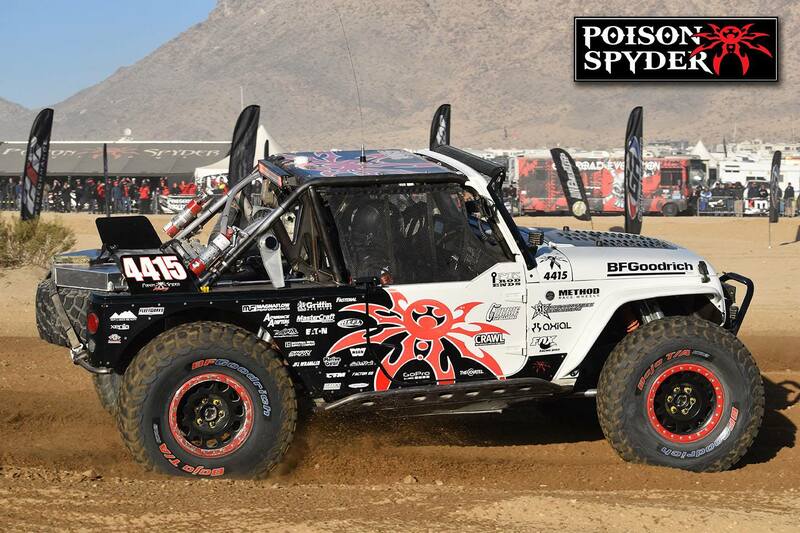 Poison Spyder will have substantial visibility as the sponsor of Saturday night’s fireworks show in addition to their contribution of over $3,000 in parts for the event’s raffle. The raffle begins at 7 p.m. on Saturday March 5, with entrants vying to win parts and accessories for their Jeep 4x4 s, trucks, pre-runners, quads and ATVs. Attendees will be participating on trail runs ranging from wild to mild including hilly, rocky and sandy stretches of terrain and narrow sections ideal for side by sides. The family-friendly event welcomes children with camping, fireworks and kid’s activities. A new headquarters location for the popular event has been established this year in response to temporary environmental issues on State Parks lands. The Southwest has been a lightning rod for recreational land use issues with huge swaths of mostly desert terrain in contention, including the recent designation of 1.8 million acres of California and Nevada desert as National Monuments by President Obama. As a not-for-profit, the Tierra Del Sol weekend is the club’s marquee annual event. The club’s origins stretch back to desert Search and Rescue teams working in the area approximately 100 miles east of San Diego. The Tierra Del Sol Club was formed in the 1940s and dedicated to exploration and adventure. Today, the club works to raise money for its events, to protect off-roading areas and maintain local trails. Transamerican Manufacturing Group (TMG) brands include Smittybilt, Pro Comp, Rubicon Express, Poison Spyder, G2 Axle & Gear, Trail Master Suspension and LRG Rims. As manufacturers of innovative aftermarket truck parts and Jeep accessories for four-wheel drive vehicles, TMG brand products are popular with off-road enthusiasts. To learn more about TMG brands, please visit transamericanautoparts.com.